It is Easter –to the amazement of the disciples the tomb is empty and people are saying something unimaginable. Someone they saw die has come to life …. On one hand it is unimaginable, yet their hearts are full of excitement and joy. We share in that rejoicing that Jesus has defeated death; that he became so completely one of us, that he will forever live among us as the Risen Christ calling us home to eternal life. In this sense, our lives are now hidden with Christ. We can’t physically see Jesus with our human eyes, however we can experience him if we have the ‘eyes of faith’ and see with a believing heart. This also applied to the apostles who didn’t recognize Jesus because there was something radically different about him, and secondly, because of doubts rising in their hearts. An open, hope filled heart enables our eyes to see beyond this physical world to ‘look for the things that are in heaven’ …to be able to recognise Jesus! For the Apostles, this faith thing wasn’t all smooth sailing. We heard in last week’s Gospel how the disciples were initially terrified because they feared the Jews and perhaps, that they would be next. This fear was an indication of their doubts about Jesus. And because of their fears and doubts they constantly failed to recognize Jesus in his risen form, sometimes even thinking they are seeing a ghost. Last week we also heard how Jesus invited Thomas to come and touch him. Ghosts do not have flesh and bones. Another time Jesus asks them to give him something to eat. Ghosts don’t eat and Jesus is no ghost, he is no disembodied soul. And death is not an escape from the body as clearly, the whole person goes into the next life. Today’s Gospel conveys another message. The message is about how they recognised Jesus. It was in the sphere of personal relationships that they recognised Jesus. In this intimate setting he gave, and they were open to him breaching their personal space. In fact, they opened themselves to this person before them, and that is precisely when they recognised Jesus. If we want to recognise the Lord, we must invite him into our personal space. Faith is personal, faith is courageous; it is an act of being open, vulnerable and desiring of the company of our loved one - our Lord Jesus. Courage! This Easter season invite Jesus into your heart more often and you will be more able to recognise him who is always on the road with us, not the road to Emmaus, but the road which is our life leading back to heaven. 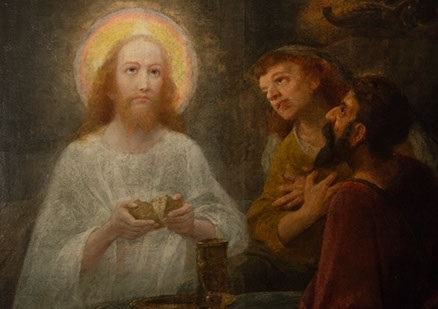 More than that, Jesus is always giving himself to us – especially in the Eucharist which is where we fully recognise Jesus for who he is – the one who loves us.